Blues Expose is a TrueFire course by Steve 'Red' Lasner and Josh Gibson where Red and Josh guide you through seven essential Blues Grooves, - Slow BLues, Organ Shuffles, Medium Shuffles, Fast Shuffles, Minor Blues, Texas Blues and Rhumba Blues. What is unique about this course is that the two guitar players separate the duties and one plays the Lead and one plays the Rhythm part of the same song. Often times you will get a Guitar Instructional Course where the instructor will play over a jam track, in this case Josh Gibson is the 'jam track' player. They play together and each section is broken down and explained. By separating the parts your ability to understand what is happening is increased. For the advanced beginner this is wonderful, it will click for you and you will see how the Rhythm and the Lead work together. 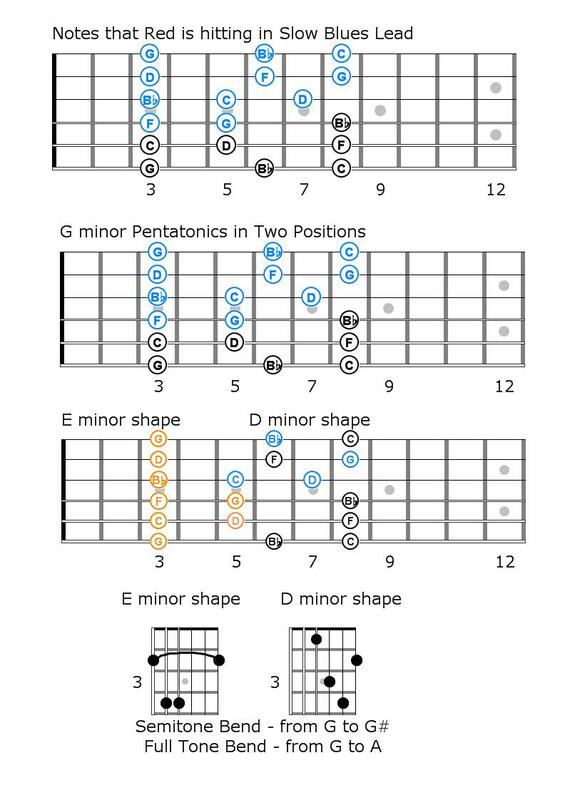 Here you can see my diagram of the notes that Red plays in that Lead along with a diagram of the G minor Pentatonic. You'll notice that Red plays on the notes in blue and if you have the course you can see the actual tab for this and every song the two play - with both the Lead and the Rhythm tabbed out separately. The discussion continues at the TrueFire Forum.